There is no release date for Grand Theft Auto V. There are no confirmed platforms for the game. All we have is one trailer and two screenshots, but some of the people who follow the business of the publisher of Grand Theft Auto, Take Two Interactive, are convinced the game will be out before the end of March. Here it is: The official Grand Theft Auto V trailer. Was it worth the wait? FY:13 guidance implies the release of Grand Theft Auto V in FY:13 [Note from Kotaku: That's Take Two's fiscal year, which runs from April 1, 2012 through March 31, 2013]. Management expects revenue to more than double yearover-year in FY:13, with non-GAAP EPS [Earnings per share] increasing from a loss of $0.71 in FY:12 to a profit of $1.75 – 2.00 in FY:13. In addition, FY:13 guidance includes an estimated 1H [First-half] loss of $(1.46) – (1.31), which implies 2H earnings of $3.06 – 3.46. We cannot construct a scenario in which Take-Two could generate the revenue or EPS needed to achieve FY:13 guidance without GTA V, given the highest combined EPS for two consecutive quarters in Take-Two's history was $2.46 (Q2/Q3 2008). We expect GTA V to sell at least 18 million units, representing a 20% attach rate to the estimated 2011 year-end installed base of PS3 and Xbox 360 in the U.S. and Europe. At this level, we estimate that Grand Theft Auto will generate at least $2.65/share in incremental EPS, making Take-Two's full-year forecast attainable. Should the game sell 24 million units (in line with its historical attach rate), we expect contribution of more than $3.65 per share in incremental EPS. Importantly, the company has a history of providing conservative guidance, and without a GTA game, we would not expect management to be so bold as to provide FY:13 earnings guidance of $1.75 – 2.00. Also, we believe that the game's developers are unlikely to risk delay very far into CY 2013 and battle declining current-generation software sales in the face of the potential introduction of next-generation consoles that year or the next. Translation: Take Two expects their current business year to get a lot better by the end of March 2013 and it doesn't seem like the boost they're expecting could be wholly attributed to how well Pachter thinks X-Com: Enemy Unknown, Borderlands 2, NBA 2K13 and BioShock Infinite—all games planned for release between now and February—will do. Pachter is not alone in predicting a looming GTA V release. On a conference call yesterday, another analyst, Mike Hickey, asked Take Two boss Strauss Zelnick about the "believability" of GTA V coming out by the end of March, something Hickey said Wall Street expects it based on Take Two's financial guidance for the year. "We just haven't talked about a release date," Zelnick said. "So obviously we can't talk about the credibility of a release date that we haven't announced." Are these guys underestimating the possible success of Take Two's announced games? Or are these folks who are paid to understand what Take Two means when it predicts its earnings on to something? 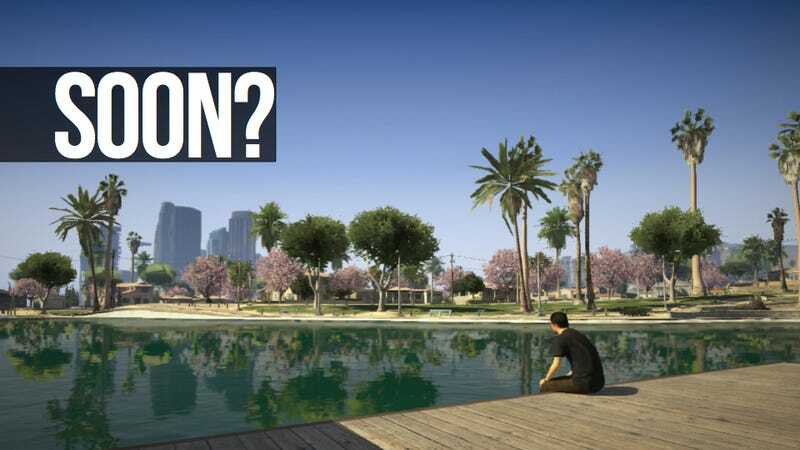 It's strange that a potential March release of GTA V would not yet be announced by Rockstar, stranger still that Pachter has even predicted that the game will be out in late 2012. The latter is hard to believe, but it's clear that the financial folks expect GTA V in the next eight months.